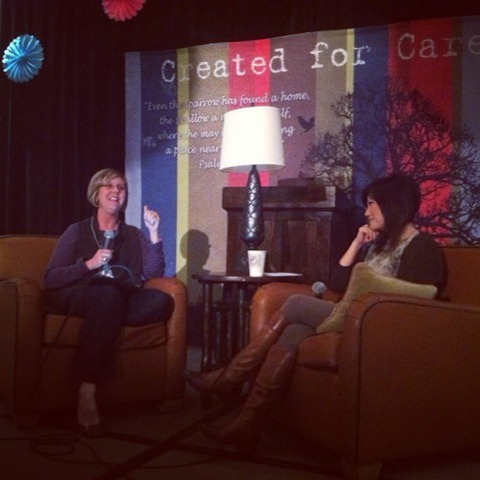 I’ve just returned from a weekend spent with 450 beautiful mamas at the Created for Care retreat. Some had adopted, some were waiting to adopt, some came just to support their friends. Lovely, inspiring, challenging, raw, surprising, healing, holy. I entered into that space a bit weary and looking forward to restoring the parts of me that have become so drained and rugged and discontent, all the parts where love has felt so absent, so depleted. For those of us who were planning and speaking and leading breakout sessions, we had been praying for all the hearts that were going to enter the gorgeous Legacy Lodge. We asked God to speak to us about what he wanted to share with each woman, knowing that he knew exactly what each person needed. We asked God to breathe new life into each soul, refreshing the places that felt lonely, fearful, inadequate, angry, shameful, worn. We asked God to send his Spirit into each corner and crevice that may be hiding from him, numbed out to him, felt forgotten by him. And he did. I got to see and experience God cover that room…with his love, with his grace, with his mercy, with his forgiveness, with his peace, with his truth, with his shalom. With himself. I stepped into that space having been invited to represent the heart, the voice, the story, of the little ones not in that room, but yet who were so present in that room. Over 1,000 little souls who were home or on their way home. Over 1,000 little souls who bring so much beauty, so much brokenness, into the lives of each family they are welcomed by. I was up for the invitation, but to be honest, I wasn’t sure if all those mamas would be up for what God had called me to share. That’s a scary feeling, especially when you know that all those mamas were coming to feel encouraged and equipped and empowered, not jolted or disoriented or challenged. That’s a risky feeling when as an adoptee you desperately want to feel accepted and approved of and liked. That’s a vulnerable position to be in when you know that all those mamas were coming to find assurance and affirmation – that what their Creator had called them to do was right…for them, for their children, for their families, for him. So, I had to trust…that what God called me to share, my voice, was exactly what I was supposed to offer. And so I did. Unnerving, unsettling, unbelievably frightening! I don’t know exactly how God will use my voice, my message, my heart, (trying to let that go), but I do know how God is already using the weekend, the conversations, the lyrics, the voices, the love in those mamas…for me. I never expected that part of my healing could come from the adoption world itself. 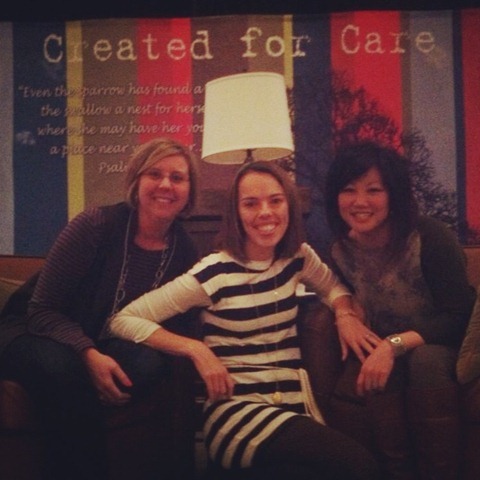 I never expected to feel affirmed and embraced and loved through other adoptive mamas. I never expected the longing and desire and love that adoptive mamas radiate for their babies to connect with my own longings to feel wanted and needed and loved. I never expected that this one adoptee’s voice would be invited out in such unique ways, and then in return find healing because of what God is doing in other family’s lives, through their stories. I never expected that having people truly “listen” and respond to the impact of relinquishment and abandonment on an adopted person’s mind and heart would bring a more solid, stronger, securer sense of self. But he did…and I’m in awe. I feel tender, open, moved. I feel ready…for more of him, more of his BIG love, more of his deep healing. And I know it will come because I’m giving myself a little more permission to let go…of her, of him, of what happened. As my hands slowly let go, I feel them opening, little by little, receiving more love, deeper connection, with those who are ready to love and connect with me, especially my husband and my babies. It’s still raw and bleeding and being gutted out, yet at the same time, it feels more free, more brave, a little more gutsy, ready…to trust. Again. Differently. Wholeheartedly. Oh, mamas…the ways in which you offered yourselves last weekend, your presence, your posture, it was deeply moving and incredibly healing for this one in a million adoptee. I write with tears and say, “Thank you, thank you, thank you….for listening.” I feel humbled and blown away that God would take my words, my voice, my ache, my fear, my story, and use it to be helpful, even if it was just a little bit, in your journey, your child’s journey. And, please, please know that your words, your voice, your ache, your fear, your stories…they brought SO much to me too. It feels like a two-way street, like this natural and fluid giving and receiving. It feels full circle. It feels like we’re in this together. It feels hopeful. And, it for sure feels WAY different from last year’s C4C retreat when I snatched a piece of decadent cheesecake and snuck back to my room to hide! I’ve come a long ways, mamas! Get ready, March 2013 women! Can’t wait to meet/re-meet you! So, to ALL of us, may we remember and “listen” to God’s voice, “Where have you come from? Where are you going? I see you.” We have to name what we’re running from and leaving and fleeing in order to know where we’re going, running to. Because where we’ve been, where we’re going…it matters. It’s seen. Big Korean adoptee Michigan hugs and love to ya’ll! PS – Would love to hear about your C4C experience too. Feel free to post your blog posts in the comments or on my Facebook page! PSS – If you have some great pictures to replace these IG ones, email them to me! 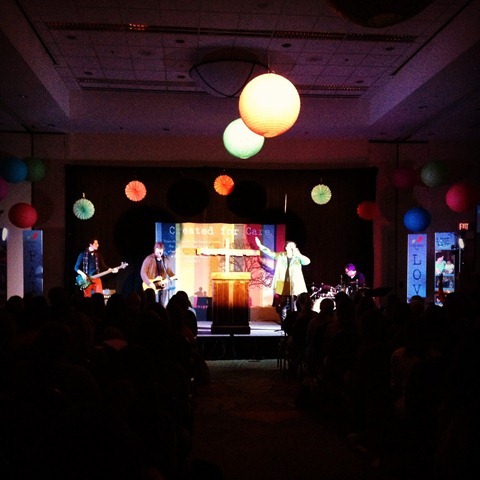 Ummm…I may have stopped chatting and started preaching. Oops! I met some really amazing people this past year who brought new perspective and insight and creativity and beauty to how I view people, the world, God. I felt enriched and strengthened by what they offer the world. Some relationships were rekindled and deepened, some faded and changed. Learning to both “let go” and embrace the gift in how each one changes me. I’m blown away by how God continued to refine me and awaken me and encourage me and use me as I think about all the lives and stories I had the opportunity to be invited into as a counselor. That space continues to be stunningly sacred and holy. I’m humbled and grateful for the places and spaces that I was able to offer my voice in different corners of the country this year. The traveling, the beautiful scenery, the energy radiated and given…it filled me and brought life to my soul. I experienced more of God’s redemption and healing in my story as I shared my one small voice in the sea of voices out there. I was a student of the human heart in new ways as I listened to and observed the people I sat next to, ran into, watched from a distance, allowing their suffering and ache and healing and hope to remind me of our humanity and the longing for wholeness that exists beyond any border, any political camp, any skin color, any gender, any religion, any family. I’ve come undone and felt desperate in new and shocking ways…mentally, emotionally, physically, and while I could write so much about this, I’m choosing to practice gratitude while I name the good in each experience, in each person, in myself. I watched my children live another year and was amazed at how their words turned into sentences, how they continue to live awake and full of awe and wonder, how their innocence keeps turning into enlightenment, how they crave love and delight and connection and safety, and how they easily and authentically remind me of what matters, of how good we are no matter what we say or do, and how important it is to keep fighting for what’s good and true. I’m utterly grateful to keep sharing each year with my husband, whose companionship and love and faithfulness keeps recycling and renewing each day. And my Creator…I’ve felt his embrace and gentleness and power and presence in ways that were both subtle and gigantic, and heard his whisper that kept calling out the best in me, even when I wasn’t sure how much energy I had left. So, starting the new year by remembering what was…and grabbing it all up, storing it in my memory, my heart. A ton of mundane, but much of the divine in the daily; an abundance of new experiences, fun and extravagant and hard. So much to remember, so much to celebrate. And then, anticipating what will be…more good, more hard, more ordinary, more extraordinary. And, learning what it means to receive it all with acceptance, with grace, with humor, with openness…to how it all fits into God’s larger story…for me, for his world. May your heart become stronger, more tender, more whole, more free. May you be reminded of who you are in profound and surprising ways as 2013 unfolds.